Previously on the code challenge #6, we built a Pomodoro timer using Vue.js. Here is the solution to the challenge. Also, check out the comments under the post for awesome submissions. 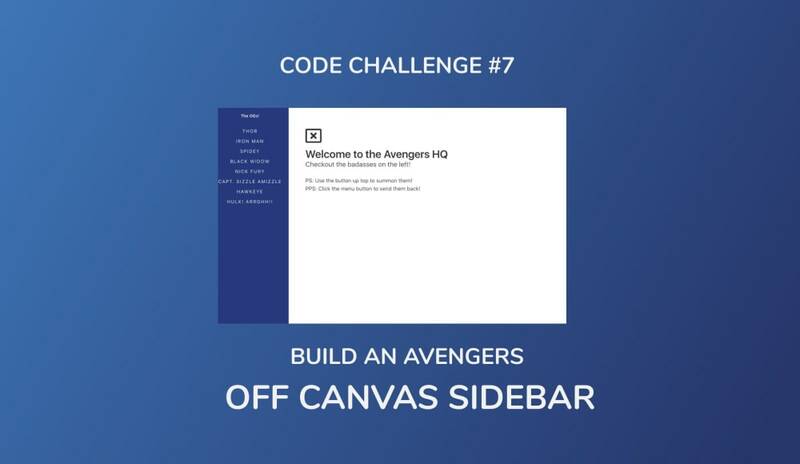 In this challenge, we are required to build a stylish but simple Off Canvas Sidebar. Sidebars are great for easy navigation across single page websites and applications and a fantastic UI improvement will be to build it out using Off Canvas. As can be seen, the goal of the challenge is to slide in the sidebar with the click of a button and slide it out with the click of another button. To make this challenge as fun as possible, feel free to build this out with any tool or technology of your choice. Want to go the extra mile? You could throw in some images and a bio for your favorite badass superhero. Also, take note of the following requirements. The sidebar should slide in with the click of a button and also slide out with the click of the same button. When the sidebar slides in, the content of the website should fit in completely on the screen and shouldn&apos;t overflow. Control transition of the sidebar when the button is clicked. Have loads of fun while completing this challenge. Understand Off Canvas and how it works. As a bonus, you could include a close-menu button and also provide a smooth transition between it and the menu button when clicked. A base codepen is provided containing HTML and CSS code. CSS variables are also used with the Sass variant. Feel free to modify it if you like. Join the Slack group to interact with others in the #codechallenge channel and also post your solution there. The solution to this challenge will be released on Sunday. Happy Coding!